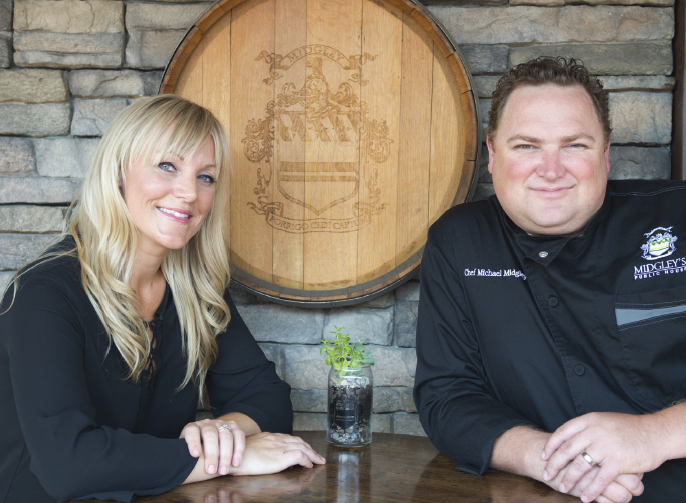 It doesn’t take much to see Michael and Laci Midgley’s passion for the community. As the owners of Midgley’s Public House, they strive to have a personal relationship not only with Lincoln Center but with the Stockton community as a whole. Head Chef Michael Midgley always wanted to own a restaurant, but the fi rst three years of Midgley’s Public House has been more than he ever dreamed of. When looking for a location for his restaurant, Lincoln Center was the perfect fi t – and has been supporting him ever since. The Midgleys can’t say enough positive things about Lincoln Center. “They have done nothing but facilitate our success,” said Laci. Another part of the restaurant’s success is credited to Michael’s appearance on reality television. He was a winner of Cutthroat Kitchen and a contestant on Top Chef. On his way to earning “celebrity chef” status, he appeared as a judge on Knife Fight and Top Chef Masters. The couple also competed on Restaurant Startup. These experiences in the spotlight have opened many opportunities for the Midgleys. Midgley’s Public House continues to gain exposure and attract customers from great distances. “Celebrity Chef” is not Michael’s only title, though. He is also an official Brand Ambassador for Certified Angus Beef. Under this name, he gets to “geek out on beef” at conferences and implement what he learns into his own restaurant. His favorite meal to make – the barrel steak sandwich and prime rib. The Midgleys always try to incorporate Lincoln Center in promotions, such as on social media and Michael’s radio show, “Mondays with Midgley” on KJOY. Living just down the street from Lincoln Center, the businesses play important roles in the Midgley family. “Our kids go to school right next to the Center – we have home, school, work, shopping at Podesto’s – everything’s right here,” said Michael. “We are literally neighbors of the Center and we believe in supporting our neighbors,” added Laci. Aside from supporting fellow Lincoln Center businesses, the Midgleys give back to the greater Stockton community. They do an annual golf tournament to benefit First Tee of San Joaquin and donate to local charities every month in the form of dinners, gift cards, and auctions.